My Sweet Petunia and Kitchen Sink Stamps Blog Hop!! Hello friends!! Happy Monday and great start of our last week of September! This year is flying by, crazy ha!! 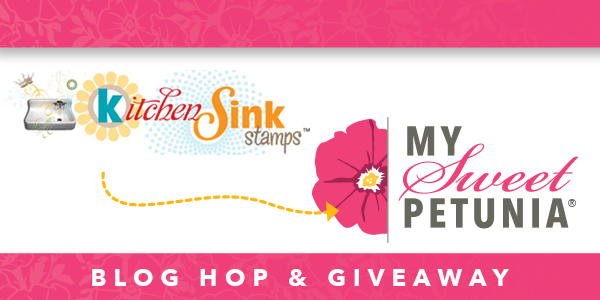 We are extremely happy to bring you another amazing collaboration blog hop between My Sweet Petunia and the Kitchen Sink Stamps!! For this hop, I got this super cute "Teddy Bear Wishes", this is a 3 layer stamp, adorable! I love this kind of stamps, baby projects are my favorite kind to make, they are always so cute. Start stamping your first layer in your lightest color, here I used Memento Desert Sand. Then add a layer of Memento Rich Cocoa. Finally, finish with the 3rd layer in Espresso Truffle. I sewed a piece of White cardstock and Patterned Paper, added the sentiment and main image, bow, dew drops and baby die-cut. And here is my card, I really love how it turned out. Everyone who comments on every stop on the hop will be entered to win one of two prizes - winner's choice of an original or mini MISTI, and a $50 Gift certificate from Kitchen Sink Stamps. Commenting deadline will be October 2nd at 11 PM Central. Winners will be announced on October 3rd on the MSP and KSS blogs. PLUS Kitchen Sink Stamps is having a Birthday Sale!! 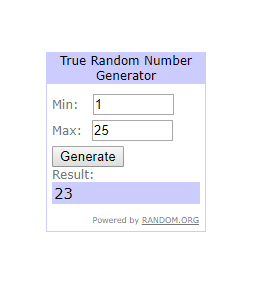 Coffee Lover Blog Hop Winner!! Hello everyone! Hope you all had/are having a great Sunday! Sorry fr my lack of posts thie week, I have been super busy creating for an upcoming show, blog hop and new release!! Not too many hours in a day, right?! Yay, Stacy!! Congratulations! Please send me your info so I can send out your prize your way!! Thanks so much to all who entered, I will have another giveaway soon!! 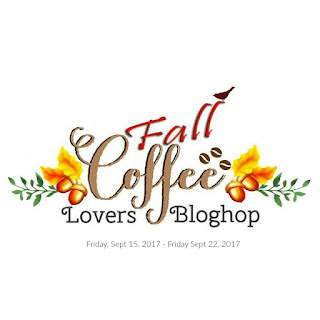 Fall Coffee Lovers Blog Hop + Giveaway!! Hello friends! 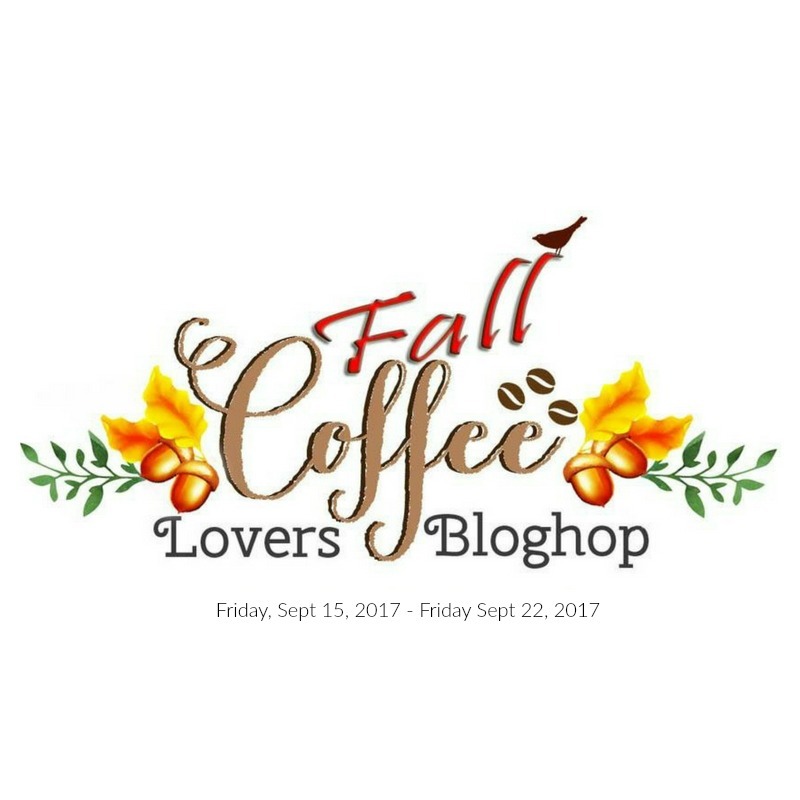 So excited to be participating on the Fall Coffee Lovers Blog Hop! Last night, I made a card and I am very happy how it turned out. 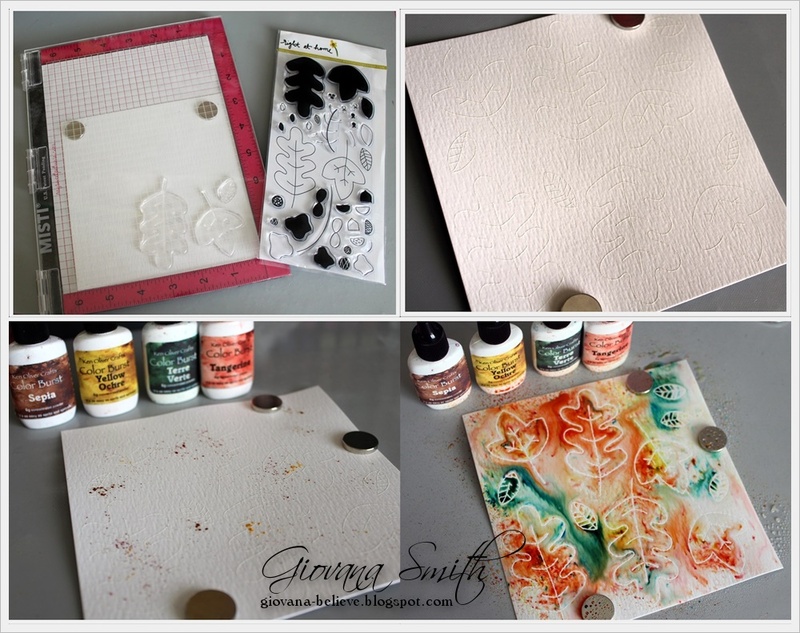 Position your Kraft watercolor card base (Ken Oliver Crafts) on your MISTI, then mask all the edges with painter tape. Stamp the coffee image from Coffee Lover set (Joy Clair Stamps) on a watercolor panel in Jet Black Ink, then stamp the leaves around, leaves are from Technique Junkies Autumn Set. And as a thank you for stopping by on my blog, I have a little giveaway for you, just leave me a comment and your name will be entered. Labels: Joy Clair, Ken Oliver Crafts, MISTI, My Sweet Petunia, Spectrum Noir Markers., Technique Junkies. Hello friends! Happy Thursday, the weekend is almost here! Around here the temperature is getting a little cooler, 70s temperature is my kind of temperature, sadly it's very smoky and reports say it will continue until we start getting snow, wow! Anyways, to celebrate the Fall days coming soon, I have a pretty card using the brand Autumn set from Technique Junkies! Go here to check out the tutorial I made, hope to get you inspired. 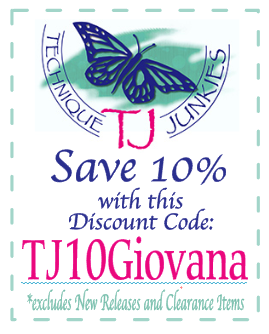 And remember if you browse the Technique Junkies store and find something you like, you can use my code to get a 10% off!! Hello friends! Happy Monday to you all! Today I have an "OLC" (one layer card) for you, I love layers, but sometimes id good to challenge yourself and create something out of your comfort zone. Start creating a card base from Ultra Premium White cardstock. Stamp image from "Elements 2" set in Memento Tuxedo Black. After image is colored, add Clear Crystal Sparkle marker. 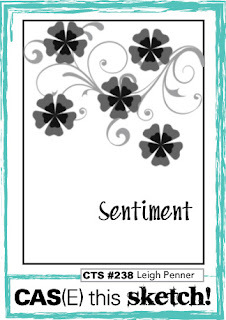 Stamp sentiment from Hello Beautiful set. Finally, add little dots of Ruby Red Liquid Pearl. Simon Says Wednesday Challenge: Stamp It. Labels: Blog Challenge, Crafter's Companion USA, Spectrum Noir Markers. Adhere the cardstock onto your MISTI, add stencil on top (I used my magnets to hold it in place), then use Fossilized Amber Distress Oxide Ink to create the fun background. Adhere a piece of White cardstock behind and add stitches, then distress all edges from both panels. Add stamped images on top of a vellum piece. Add the panel to a black card base and you are done! Entering this card to Simon Says Wednesday Challenge: Stamp It. Hello friends!! Hope you are having a fantastic day! Here in the PNW we are dealing with very unhealthy to hazardous air quality :( Hard to go outside, everything looks foggy and the smells is horrible. Praying for rain. Anyway, I have a very "Fall-y" card for you today, by the way, have you commented on the My Sweet Petunia and Right At Home blog hop? You still have time to comment and your name will be added, you can be a lucky a winner!! Enter HERE. For my card I used "Fall Leaves" set, stamped them in Watercolor paper, Versamark ink and White embossing powder, then heat set, cut them out and them added Color Burst Powders! (Sepia, Yellow Ochre, Terra Verte, Tangerine). The background was created on a Kraft 5"x 7" card, added Copper Liquid Metals , then mist the paper and voila!! Finally, I added twine and sequins, ad my card was done! Labels: Blog Challenge, Color Burst, Ken Oliver Crafts, Right at Home. Hello friends! 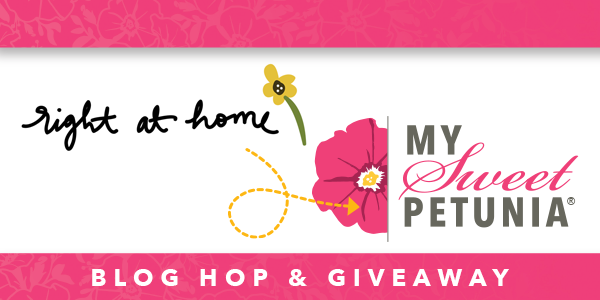 Welcome another fun blog hop, this time the My Sweet Petunia and Right at Home Design Team are teaming up to share with you amazing creation using products from both companies! And we also have amazing giveaways, we will draw 2 lucky winners from all the comments from the hop, so please leave a comment on every blog to be eligible win one of two prizes: Winner's choice of an original or mini MISTI, and a prize package from Right at Home (Sunflower stamp set, Harvest Blessings stamp set (new release) and two Distress Oxide Inks: Cracked Pistachio and Peeled Paint). If you arrive here from Maria's blog, you are in the right place, if not start at Nicole's, so you don't miss out any of the participant blog. I have two projects for you today, I even took pictures of the process from this card (click on the pictures fro a larger version), so let's get started. Start stamping the leaves from "Fall Leaves" set on a piece of watercolor paper, ink them up with Memento Rich Cocoa for the outlines and then the solid images with Wild Honey Distress Ink and Memento Tangelo.For the small outlines use Memento Love Letters, Memento Pistachio, Memento Dandelion. Stamp the outline leaves on a piece of watercolor paper. Apply white embossing powder and heat set. After that, add little bits of Color Burst (Sepia, Yellow Ochre, Terra Verte, Tangerine), mist water. Let it air dry or speed the process with a heat gun. Cut them out or die-cut. Finally, stamp the sentiment from Script Greetings set on a piece of clear vellum in Vintage Mahogany Embossing powder (Recollections), then add stitches. Adhere the card panel to a 5.5" x 5.5" white card base. Add the embossed leaves to the side. Embellish with silver thread. This is the final card. Here I stamped the images ink Memento Love Letter, Memento Angel Pink, Memento Pistachio, Memento Bamboo Leaves, Memento Tangelo, Memento Dandelion, Memento Gray Flannel, Memento Rich Cocoa, SU Coastal Cabana and Delizata Golden Glitz. Sentiment was stamped in Jet Black ink and finally added clear and blue rhinestones. Labels: Blog Hop, MISTI, My Sweet Petunia, Right at Home. Hello friends!! Welcome to another amazing Technique Junkies Release!! September is bringing you 21 new stamps!! and the Design Team is going to knock you out the park with their incredible ideas for you!! So, if you arrived here from Vicki's blog, you are in the right place, if not, head to the Technique Junkies blog to the start of the hop. And this month we have something extra special for you!! All of the September 2017 New Release stamps are 15% off through September 8th!We can all use a little bargain, right? No codes needed, just put them in your shopping cart and the discount will be applied at checkout. So, I have 3 projects for you today using 4 sets from this new release! So, my first two projects are super cute! Perfect to send to your favorite Vet :), friends and family. Here are the two sweet faces :D Are you a paper hoarder? I used paper from EPP collection from 2011!! Oh my! This pack is one of my favorites ever and I am sad I have few pages left only. For this card, I used the sweet Christmas dog and sentiment from Gifts of Christmas. I stamped the image on a piece of white cardstock in Memento Tuxedo Black using my MISTI. After that, I stamped the image once again in Versamark Watermark and added Clear embossing powder and heat set it, I stamped another image using the same technique just for the hat, colored it with Spectrum Noir markers, then added Crystal Lacquer to the white edge and white Gala Glitz, then covered the rest of the hat with Crystal Lacquer. I let it dry overnight. Create a frame using Square dies and red glitter cardstock, die-cut snowflakes in gold cardstock and voila!! And finally a Santa card! For this card I used Santa in Moonlight and the sentiment from Gifts of Christmas. Here I again stamped the image with Memento Tuxedo Black and then Versamark Watermark and clear embossing powder. then covered the moon area and sponged the image with Tumble Glass and Stormy Sky Distress Inks. Then added a couple of die-cuts and stamped the sentiment in Blue ink. Now, time to hop over to Chris' blog and check her amazing creations! Don't forget to leave a comment, maybe you can be the $100 gift certificate winner. Labels: Blog Hop, Technique Junkies.